The season registration for an ATV is valid for one year, commencing on July 1st of each year. Fees listed below do not include the agent fee. During Free ATV weekend a nonresident may operate in Maine on an ATV that is not registered in Maine if the nonresident's ATV has a valid registration from another state or Canadian province. A person under 10 years of age may not operate an ATV. A person 10 years of age or older but under 16 years of age may not operate an ATV unless that person has successfully completed a training course approved by the department and is accompanied by an adult. A person under 16 years of age may not cross a public way maintained for travel unless the crossing is in accordance with section 13157-A, subsection 6, paragraph A and the person satisfies the requirements of 13154-A. As used in this subpart, unless the context otherwise indicates, the following terms have the following meanings. Accompanied by adult. "Accompanied by an adult" means, with respect to operation of an ATV, within visual and voice contact and under the effective control of a child's parent or guardian or another person 21 years of age or older. All-terrain vehicle or ATV. "All-terrain vehicle" or "ATV" means a motor- driven, off-road, recreational vehicle capable of cross-country travel on land, snow, ice, marsh, swampland or other natural terrain. "All-terrain vehicle" or "ATV" includes, but is not limited to, a multitrack, multiwheel or low-pressure tire vehicle; a motorcycle or related 2-wheel, 3-wheel or belt-driven vehicle; an amphibious machine; or other means of transportation deriving motive power from a source other than muscle or wind. For purposes of this subpart, "all-terrain vehicle" or "ATV" does not include an automobile as defined in Title 29-A, section 101, subsection 7; an electric personal assistive mobility device as defined in Title 29-A, section 101, subsection 22-A; a truck as defined in Title 29-A, section 101, subsection 88; a snowmobile; an airmobile; a construction or logging vehicle used in performance of its common functions; a farm vehicle used for farming purposes; or a vehicle used exclusively for emergency, military, law enforcement or fire control purposes. Alpine tundra. "Alpine tundra" means high elevation, treeless areas beyond the timberline that are dominated by low herbaceous or shrubby vegetation and, specifically, areas that are designated as alpine tundra by the Department of Agriculture, Conservation and Forestry by rule pursuant to Title 5, chapter 375, subchapter 2. Dwelling. "Dwelling" means any building used as a permanent residence or place of domicile. Freshwater marshes and bogs. "Freshwater marshes and bogs" means naturally occurring open areas with saturated soils or peat, often associated with standing water and dominated by low herbaceous vegetation, grasses, weeds and shrubs and including wetlands, as shown on the Freshwater Wetlands Map Series, Division of Geology, Natural Areas and Coastal Resources, Maine Geological Survey, or zoned as a Wetland Protection Subdistrict, P-WL, by the Maine Land Use Planning Commission. Operate. "To operate," in all its moods and tenses, when it refers to an ATV, means to use an ATV in any manner within the jurisdiction of the State, whether or not the vehicle is moving. Operator. "Operator" means the person who is in control or in charge of an ATV while it is in use. Owner. "Owner" means: For the purposes of registration of an ATV, a person holding title to an ATV. Private Way As defined by Title 23, section 1903-10-A,. "Private Way" means a private road, driveway, or public easement. "Public easement" means an easement held by a municipality for purposes of public access to land or water not otherwise connected to a public way, and includes all rights enjoyed by the public with respect to private ways dedicated to the public. Protective headgear. "Protective headgear" means a helmet that conforms with minimum standards of construction and performance as prescribed by the American National Standards Institute specification Z90.1 or by the Federal Motor Vehicle Safety Standard No. 218. Public Way, As defined by Title 23, section 1903-11. "Public Way" means any road capable of carrying motor vehicles, including, but not limited to, any state highway, municipal road, county road, unincorporated territory road, or other road dedicated to the public. §13002 – Collection by Commissioner. The commissioner or agents of the commissioner shall act on behalf of the State Tax Assessor to collect the use tax due under Title 36, chapters 211 to 225 in respect to any ATV for which an original registration is required under this Title at the time and place of registration of that ATV. All taxes collected pursuant to this section must be transmitted forthwith to the Treasurer of State and credited to the General Fund as undedicated revenue. The Legislature shall appropriate to the department in each fiscal year an amount equal to the administrative costs incurred by the department in collecting revenue under this section. Those administrative costs must be verified by the Department of Administrative and Financial Services. For purposes of this section, "original registration" means any registration other than a renewal of registration by the same owner. §13003 – Payment of sales or use tax prerequisite to registration. C. The applicant possesses a dealer's certificate showing that the sales tax was collected by the dealer. The State Tax Assessor shall prescribe the form of a dealer's certificate. D. The ATV is otherwise exempt from sales or use tax under Title 36, section 1760. §13004 – Collection by State Tax Assessor. This section and sections 13002, 13003 and 13005 must be construed as cumulative of other methods prescribed in Title 36 for the collection of the sales or use tax. These sections do not preclude the State Tax Assessor's collecting the tax due in respect to any watercraft, ATV or snowmobile in accordance with such other methods as are prescribed in Title 36 for the collection of the sales or use tax. §13005 – Certificates to be forwarded to State Tax Assessor. An agent of the commissioner shall promptly forward all certificates submitted in accordance with section 13003 to the commissioner. The commissioner shall transmit all such certificates to the State Tax Assessor. §13006 – Impoundment of ATVs. When a law enforcement officer issues a summons for a violation under chapter 939, the officer may impound the ATV operated by the person who receives the summons if, in the judgment of the officer, based on actual previous offenses by the operator or other considerations, the operator will continue to operate the ATV in violation of chapter 939 and that operation may be a hazard to the safety of persons or property. The operator or owner of an ATV impounded under this section may reclaim the ATV at any time subsequent to 24 hours after the issuance of the summons upon payment of the costs of impoundment to the enforcement agency impounding the ATV. §13107 – Unlawfully operating vehicle on snowmobile trail. A person may not operate any 4-wheel drive vehicle, dune buggy, all-terrain vehicle, motorcycle, or any other motor vehicle, other than a snowmobile and appurtenant equipment, on snowmobile trails that are financed in whole or in part with funds from the Snowmobile Trail Fund, unless that use has been authorized by the landowner or the landowner's agent, or unless the use is necessitated by an emergency involving safety or persons or property. Exception: An ATV with tracks, registered as a snowmobile, may be operated on snowmobile trails. §13152 – License and training. 1. License. An operator's license is not required for the operation of an ATV, except as required by Title 29-A. C. A safety training site approved by the department. A person under 16 years of age must attend the training program with that person's parent or guardian. The training program must include instruction on the safe operation of ATV's the laws pertaining to ATVs, the effect of ATV's on the environment and ways to minimize that effect, courtesy to landowners and other recreationists and landowners and other materials as determined by the department. §13153 – Rule violations; ATVs. The following penalties apply to violations of rules regulating ATVs. 1. Civil. Notwithstanding section 10650, a person who violates a rule regulating ATVs commits a civil violation for which a fine of not less than $100 nor more than $500 may be adjudged. 2. Criminal. A person who violates a rule regulating ATVs after having been adjudicated as having committed 3 or more civil violations under this Part within the previous 5-year period commits a Class E crime. 1. Minimum age. Except as provided in subsection 5, a person under 10 years of age may not operate an ATV. 2. Permitting child less than 10 years to operate ATV. Except as provided in subsection 6, a person may not permit a child under 10 years of age to operate an ATV. 3. Unlawfully operating ATV by person ages 10 to 16 years of age. Except as provided in subsection 6, a person 10 years of age or older but under 16 years of age may not operate an ATV unless that person has successfully completed a training course approved by the department pursuant to section 13152 and is accompanied by an adult. Proof of having completed a training course must be presented for inspection upon request of a law enforcement officer. 4. Person under 16 years of age crossing public way. A person under 16 years of age may not cross a public way maintained for travel unless the crossing is in accordance with section 13157-A, subsection 6, paragraph A and the person satisfies the requirements of subsection 3. 5. Permitting an unaccompanied person under 16 years of age to operate an ATV. Except as provided in subsection 6, a person may not permit an unaccompanied person 10 years of age or older but under 16 years of age to operate an ATV. 1-A. Operating unregistered ATV. Except as provided in paragraph A, a person may not operate an ATV that is not registered in accordance with subsection 3. A. The following exceptions apply. (1) Registration is not required for an ATV operated on land on which the owner lives or on land on which the owner is domiciled, as long as the ATV is not operated elsewhere within the jurisdiction of the State. (2) Registration is not required for an ATV operated by a commercial ski area for the purpose of packing snow or for rescue operations on the commercial ski area, unless the ATV is required to cross a public way during that operation. (3) An ATV owned and operated in the State by the Federal Government, the State or a political subdivision of the State is exempt from registration fees but must be registered and is required to display registration numbers. (4) An ATV registration for the farm use specified in Title 29-A, section 501, subsection 8, paragraph E is not required for a vehicle registered with the Secretary of State under Title 29-A, section 501, subsection 8. (5) An ATV registered in another state or in a Canadian province may be operated without being registered pursuant to this section at a special event organized to occur in this State if the special event organizer submits a request in writing to the commissioner 60 days prior to the special event and provides the commissioner with a map of the trails to be used during the special event and the commissioner approves the request. (6) An ATV owned or under the control of an ATV manufacturer may be operated without a Maine registration at a demonstration event organized to occur in this State if such operation is approved by the commissioner. An ATV manufacturer or a representative of an ATV manufacturer must submit a request in writing to the commissioner at least 60 days prior to the demonstration event and shall include a description and the location of the event. (7) The Commissioner may annually establish one 3-consective-day period, 2 days of which are weekend days, during which a non-resident may operate an ATV that is not registered in Maine, if the non-resident's ATV has a valid registration from another state or a Canadian province. 2. Reciprocity. Reciprocity was repealed in 2004 so there are no longer reciprocal privileges for ATV registrations. 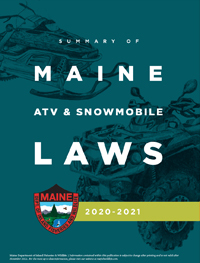 A Maine ATV registration is required for nonresidents to operate an ATV in the State of Maine. 3. Application and issuance. The commissioner, or an agent designated by the commissioner, may register and assign a registration number to an ATV upon application and payment of an annual fee by the owner. The commissioner shall charge a fee of $1 in addition to the annual fee for each registration issued by an employee of the department. The registration number in the form of stickers issued by the commissioner must be clearly displayed on the front and rear of the vehicle. A registration is valid for one year commencing July 1st of each year, except that any registration issued prior to July 1st but after May 1st is valid from the date of issuance until June 30th of the following year. 4. Form of registration. An ATV registration must be in such form as the commissioner may determine. 5. Fees. See Registration Fees. 6. Duplicate registration certificate. The holder of a registration certificate issued under this section may obtain a duplicate registration from the commissioner upon application and payment of a duplicate fee of $1. If a sticker has been misplaced, a new sticker and a new registration matching the new sticker number must be obtained at a fee of $1 each. Agent fee also applies to all duplicates. 7. Transfer of ownership, discontinuance of use. A transfer of ownership or discontinuance of use of an all-terrain vehicle is subject to this subsection. A. Whoever transfers the ownership or discontinues the use of a registered all-terrain vehicle shall, within 10 days, properly sign the registration, indicate the disposition of the all-terrain vehicle and return the registration to the commissioner. B. An all-terrain vehicle owner who transfers ownership or discontinues its use may, within 10 days from the date of transfer or discontinuance, apply to the commissioner for registration of another all-terrain vehicle. The fee for the transfer is $4, and the registration is valid for the remainder of the registration year for which the previous all-terrain vehicle had been registered. C. When there is a change of ownership of an all-terrain vehicle for which a registration has previously been issued, the new owner shall apply for a new registration and shall pay the applicable fee under subsection 5. 8-A. Registration inspection. An owner or operator of an ATV shall present a registration certificate or an online registration receipt for inspection by any law enforcement officer on demand. 8-B. Notification of destroyed, abandoned, stolen, or permanently removed ATV. The registrant shall notify the commissioner if an ATV is destroyed, abandoned, stolen, or permanently removed from the State. 9. Display of registration numbers. Each new ATV sold in the State must have a space 6 inches in width by 3½ inches in height provided on the front and rear of the machine, as high above the tires as possible, for the vertical display of the registration numbers. A person may not operate an ATV that is required to be registered under this section unless registration numbers in the form of stickers are displayed in these spaces or as otherwise required by the department. A person may operate an ATV registered online without displaying a registration number until that person receives the registration certificate from the department or for 30 days after registering the ATV online, whichever occurs first. 10. Training and education. The department shall provide training and education relating to ATVs. B. The spouse and children of the person described in paragraph A, provided that the spouse and children permanently reside with that person. A member of the armed forces described in paragraph A who desires to register an ATV shall present certification from the commander of the post, station or base, or from the commander's designated agent, that the member is permanently stationed at that post, station or base. Registration fees for registrations pursuant to this subsection must be allocated as if the person registering the ATV was a resident of the municipality in which the post, station or base is situated. §13157-A – Operation of ATVs. 1-A. Permission required. A person may not operate an ATV on the land of another without the permission of the landowner or lessee. Permission is presumed on designated state approved ATV trails or in areas open to ATVs by landowner policy. A landowner may limit the use of a designated state-approved ATV trail on that landowner's property through agreements with the State or an ATV club to address environmental, public safety or management concerns. Written permission of the landowner or lessee is required on cropland or pastureland or in an orchard. As used in this subsection, "cropland" means acreage in tillage rotation, land being cropped and land in bush fruits, and "pastureland" means acreage devoted to the production of forage plants used for animal production. Nothing in this subsection may be construed to limit or expand a land owners property rights. 2. Stop and identify requirement. Persons operating ATVs upon the land of another shall stop and identify themselves upon the request of the landowner or the landowner's duly authorized representative. (2) The Commissioner of Transportation may issue special permits for designated crossings of controlled access highways. (3) A person on a properly registered ATV may operate the ATV within the right-of-way limits of a controlled access highway on a trail segment approved by the Commissioner of Transportation or the board of directors of the Maine Turnpike Authority, as applicable. At the request of the Commissioner of Agriculture, Conservation and Forestry, the Commissioner of Transportation or the board of directors of the Maine Turnpike Authority, as applicable, may permit construction of an ATV trail within the right-of-way of a controlled access highway under the jurisdiction of the Department of Transportation or the Maine Turnpike Authority being constructed on or after January 2, 2016 when there is an ability to provide for the continuity of a state-owned or state controlled network of ATV trails. Funds for the construction of an ATV trail under this paragraph may not be provided from the Highway Fund. 4. Unlawfully operating ATV on snowmobile trail. A person may not operate any 4-wheel-drive vehicle, dune buggy, all-terrain vehicle, motorcycle or any other motor vehicle, other than a snowmobile and appurtenant equipment, on snowmobile trails that are financed in whole or in part with funds from the Snowmobile Trail Fund, unless that use has been authorized by the landowner or the landowner's agent, or unless the use is necessitated by an emergency involving safety of persons or property. Exception: ATV's with tracks, registered as snowmobiles can be operated on a snowmobile trail. 5-A. Operating a truck, pickup truck or passenger vehicle on an ATV trail. A person may not operate a truck, pickup truck, or passenger vehicle on a designated ATV trail that is not on a gravel road system unless authorized by the landowner or landowner's agent, or in an emergency involving the safety of a person or property. For purposes of this law, "pickup truck" and "truck" have the same meaning as in Title 29-A section 101, subsections 55 and 88 and "passenger vehicle" means a self-propelled 4-wheel motor vehicle designed primarily to carry passengers on public roads. A. A properly registered ATV may be operated on a public way only the distance necessary, but in no case to exceed 500 yards, on the extreme right of the traveled way for the purpose of crossing, as directly as possible, a public way, bridge, overpass, underpass, sidewalk or culvert as long as that operation can be made safely and does not interfere with traffic approaching from either direction on the public way. C. An ATV may be operated on any portion of a public way when the public way has been closed in accordance with Title 23, section 2953. D. An ATV may be operated on a public way that is not maintained or used for the operation of conventional motor vehicles, except that operation on the left side of the way is prohibited prohibited during the hours from sunset to sunrise. E. An ATV may be operated on streets and public ways during a period of emergency when the emergency has been so declared by a police agency having jurisdiction and when travel by conventional motor vehicles is not practicable. F. An ATV may be operated on streets and public ways in special events of limited duration conducted according to a prearranged schedule under a permit from the governmental unit having jurisdiction. G. An ATV may be operated on a public way on the extreme right of the traveled way by a law enforcement officer for the sole purpose of traveling between the place where the ATV is usually stored and an area to be patrolled by the law enforcement officer. G. An ATV may be operated on a public way on the extreme right of the traveled way by a law enforcement officer for the sole purpose of traveling between the place where the ATV is usually stored and an area to be patrolled by the law enforcement officer. H. Notwithstanding paragraphs A to G, an ATV may be operated on the extreme right of a public way, or as directed by the appropriate governmental unit within the public way, of a municipality or an unorganized or unincorporated township if the appropriate governmental unit has designated the public way as an ATV-access route. An ATV must travel in the same direction as motor vehicle traffic on a public way designated as an ATV access route. A public way designated by an appropriate governmental unit as an ATV-access route must be posted conspicuously at regular intervals by that governmental unit with highly visible signs designating the ATV-access route. Before designating a public way as an ATV-access route, the appropriate governmental unit shall make appropriate determinations that ATV travel on the extreme right of the public way, or as directed by the appropriate governmental unit within the public way may be conducted safely and will not interfere with vehicular traffic on the public way. For purposes of this paragraph, "appropriate governmental unit" means the Department of Transportation, county commissioners or municipal officers within their respective jurisdictions. The jurisdiction of each appropriate governmental unit over public ways pursuant to this paragraph is the same as its jurisdiction over the passage of vehicles on public ways pursuant to Title 29-A, section 2395. Municipal or county law enforcement officials having jurisdiction have primary enforcement authority over any route established under this paragraph. (2) The ATV must have mounted on the rear at least one taillight capable of displaying a light that must be visible at a distance of at least 100 feet behind the ATV. (2) A person may operate an ATV without a headlight and taillight between sunrise and sunset. (2) At any time when, due to insufficient light or unfavorable atmospheric conditions caused by fog or otherwise, other persons, vehicles and other objects are not clearly discernible for a distance of 500 feet ahead. (2) Operate an ATV across the tracks of a railroad after having been forbidden to do so by the railroad owning the railroad right-of- way or by an agent of that railroad, either personally or by appropriate notices posted conspicuously along the railroad right-of-way. B. Notwithstanding paragraph A, a person may operate within the right-of-way of a portion of railroad line that has been officially abandoned under the authority of the Interstate Commerce Commission. 19. Operating too close to certain buildings. person may not operate an ATV within 200 feet of a dwelling, hospital, nursing home, convalescent home, or church. (3) Land that the operator owns or is permitted to use. D. Remove or destroy signs or posted notices. (3) Operate an ATV without a working spark arrester. B. In addition to any penalties imposed under this subsection, the court may, subject to section 9321 and Title 17-A, chapter 54, order restitution for fire suppression costs incurred by state or municipal government entities in suppressing a fire caused by an ATV operating without a working spark arrester. (c) In a source water protection area as defined in Title 30-A, section 2001, subsection 20-A. The provisions of this subparagraph do not apply to a trail designated for ATV use by the Department of Agriculture, Conservation and Forestry. The provisions of this subparagraph also do not apply to a person accessing land for maintenance or inspection purposes with the landowner's permission or to local, state, or federal government personnel in the performance of official duties, provided there is no significant ground disturbance or sedimentation of water bodies. §13158-A – Unlawfully permitting operation; liability for damage by other persons. 1. ATV owner; operation by another. A person is in violation of this subsection if that person is the owner of an ATV that is operated in violation of this chapter. 2. Parent or guardian; operation by minor. A person is in violation of this subsection if that person is a parent or guardian responsible for the care of a minor under 18 years of age who is operating an ATV in violation of this chapter. 3. Furnishing ATV. An owner of an ATV, a person who gives or furnishes an ATV to a person and a parent or guardian responsible for the care of a minor under 18 years of age are jointly and severally liable with the operator for damages caused in the operation of the vehicle or by the minor in operating any ATV. Notwithstanding section 13155 and section 13157-A, subsection 16, paragraph A, subsection 17, and subsection 25 ATVs used exclusively for scheduled racing meets and operated solely on predefined race courses are exempt from the provisions of this chapter concerning registration, mufflers, snorkel kits, and lights during the time of operation at these meets and at all prerace practices at the location of the meets. §13160 – Dealer's registration and license. 1. Application and issuance. A person may not engage in the business of selling ATVs in the State unless that person has registered as a dealer and secured a valid dealer's license from the commissioner. A dealer so registered and licensed need not register individual ATVs. 2. Fees. The annual license fee for a dealer registered under subsection 1 is $15. The license runs from July 1st of each year. A. A dealer licensed under Title 29-A, section 954, subsection 2 is not required to pay the license fee under this subsection. 3. Dealer's number plates. Dealer's number plates must be provided and obtained as follows. B. Replacements for lost or stolen plates may be obtained for a fee of $5 for each plate. C. If a number plate is lost or stolen, the owner shall notify the commissioner immediately. 4. Temporary registration certificate. The commissioner may issue temporary registration certificates to a registered dealer who may, upon the sale or exchange of an ATV, issue a temporary registration certificate to a new owner, in order to allow the new owner to operate the ATV for a period of 20 consecutive days, after the date of sale in lieu of a permanent number as required by this chapter. The fee for each temporary registration is $1. 5. Display of dealer's number plate. A dealer shall display the dealer's number on each ATV being used until the sale of the ATV, whereupon it becomes the owner's responsibility to register the ATV. 6. Warranties and information on used ATVs. A dealer who offers a warranty in connection with the sale or transfer of a used ATV shall furnish a written statement concerning that warranty. The statement regarding the warranty must indicate the parts or systems of the vehicle that are covered and those not covered by the warranty and what the dealer will do in the event of a defect and at whose expense repairs be made. The dealer shall also furnish before sale a written statement identifying any and all defects known to the dealer and any type of damage that the vehicle has sustained if such information is known to the dealer. §13161 – Sale of ATV; light equipment. (2) Has an engine size of 90 cubic centimeters or less and has 4 or more wheels. This is a summary of penalties for ATV. For full language please refer to Title 12. A person may not fail or refuse to stop any ATV on request or signal of any law enforcement officer in uniform whose duty it is to enforce ATV laws. A person who violates this provision commits a Class D crime, for which a minimum fine of not less than $1,000 must be adjudged. If convicted there is a mandatory one year suspension of all licenses, permits and registrations by the department. A person may not attempt to elude a law enforcement officer by: operating or attempting to operate an all-terrain vehicle past a clearly identifiable police roadblock; or after being requested or signaled to stop by a law enforcement officer in uniform, operating or attempting to operate an all-terrain vehicle at a reckless rate of speed. A person who violates this provision commits a Class D crime, for which a minimum fine of not less than $1,000 must be adjudged. If convicted there is a mandatory one year suspension of all licenses, permits and registrations by the department. A person may not operate an ATV in such a way as to recklessly create a substantial risk of serious bodily injury to another person. A person who violates this provision commits a Class D crime. If convicted there is a mandatory one year suspension of all licenses, permits and registrations by the department. A person may not operate an ATV so as to endanger any person or property. A person who violates this provision commits a Class E crime. If convicted there is a mandatory one year suspension of all licenses, permits and registrations by the department. A person may not operate an ATV except at a reasonable and prudent speed for the existing conditions. A person who violates this provision commits a Class E crime. Remove or destroy signs or posted notices. A person who violates this subsection commits a Class E crime. If convicted there is a mandatory one year suspension of all licenses, permits and registrations by the department. Any conviction or adjudication for a violation of this Part is grounds for suspension of any license or permit issued under this Part. Except where provided by law, the commissioner shall determine the suspension period. To suspend a license or permit based upon a conviction or adjudication, the commissioner shall follow the procedures under section 10903. Operating an ATV on the land of another without permission. If the commissioner suspends a license, permit or registration pursuant to this subsection, the suspension must be for at least 90 days. Abuse of another person's property. Operating an ATV under the influence. Operating an ATV to endanger. Reckless operation of an ATV. Failure or refusal to stop an ATV or attempting to elude an officer.